Tableaux of Tripura, the Central Industrial Security Force (CISF) and the Indian Council for Agricultural Research (ICAR) won the first prize for the Republic Day Parade at the Rajpath, an official statement said Monday. Defence Minister Nirmala Sitharaman presented the awards at a ceremony on Monday. Under the states and union territories category, the first prize went to Tripura for its float based on the theme of 'Empowering Rural Economy in Gandhian Way'. The second prize went to Jammu and Kashmir for its theme on 'Gandhiji's Ray of Hope - Our Composite Culture' and the third prize to Punjab for its float on the theme of 'Jallianwala Bagh'. 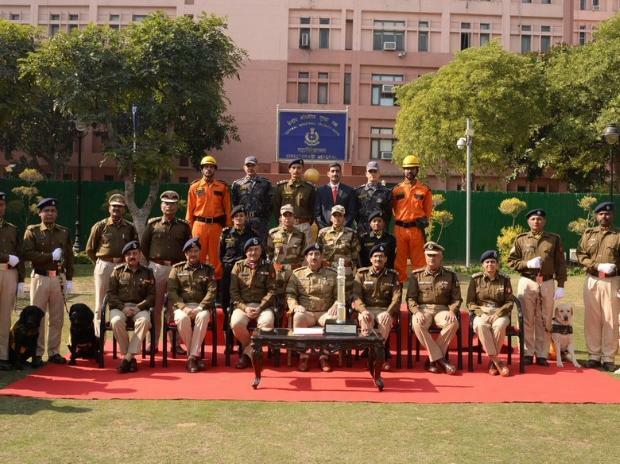 DG #CISF Shri Rajesh Ranjan felicitated #CISF Tableau team who participated & won best tableau trophy in #RepublicDay2019 Parade. The CISF's float was based on the theme 'Securing National Assets - 50 Glorious Years' while the ICAR tableau was on 'Kisan Gandhi'. The Central Public Works Department (CPWD) received a special prize for a tableau on 'Vande Mataram'. Sitharaman also presented the award for the 'Best School Children Item' to Navy Children School, Chanakyapuri and a consolation prize to Rajkiya Pratibha VikasH Vidyalya (RPVV), Kishan Ganj in New Delhi.